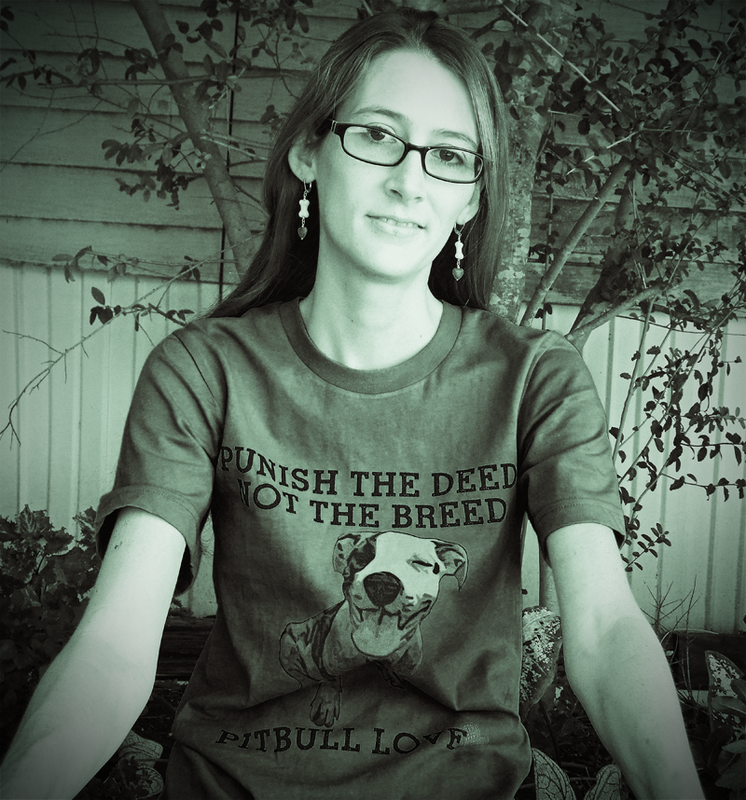 National Pit Bull Awareness Day | Wearing My Pit Bull Pride with Dog City & Co.
Today is National Pit Bull Awareness Day. 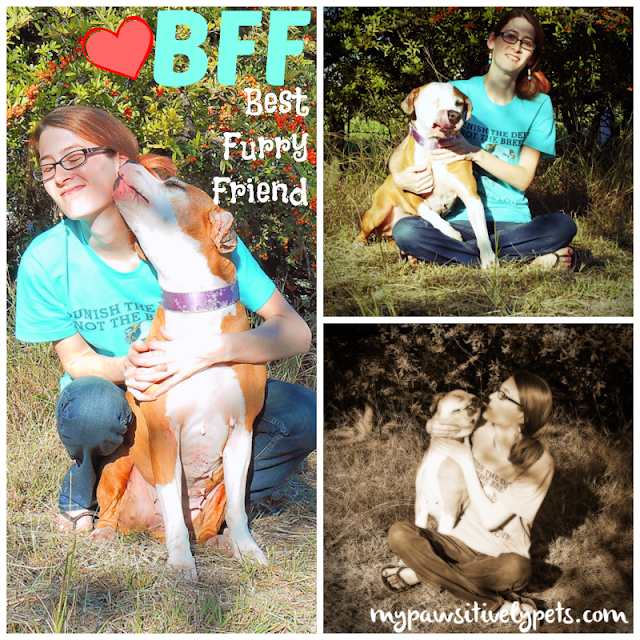 Actually, the entire month of October is Pit Bull Awareness Month and Adopt a Pit Bull Month. I, therefore, am donning October as just plain old "Pit Bulls are Awesome Month"! National Pit Bull Awareness Day began in 2007 and is "a day of appreciation and education designed to change perceptions and stereotypes about pit bulls and their responsible owners. NPBAD was established to educate and foster positive communications and experiences in the communities in which we and our dogs live, and it is an initiative dedicated to restoring the image of the American Pit Bull Terrier", according to NationalPitBullAwarenessDay.org. 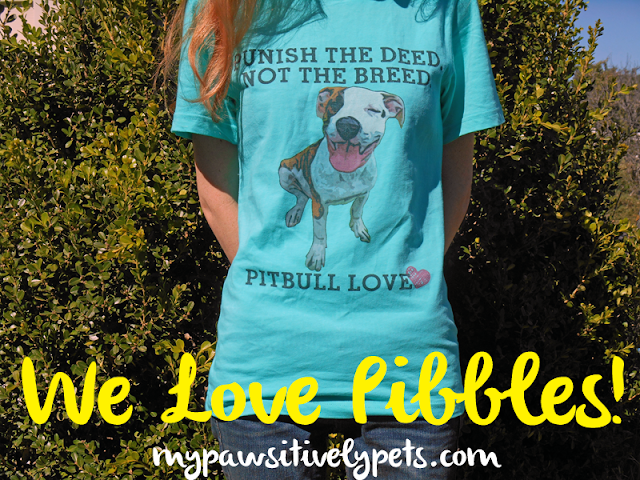 So are you wondering where I got my totally awesome Pit Bull pride shirt from yet? The shirt is from a company called Dog City & Co. They have created some pretty nifty products for pet lovers including T-shirts, totes, canvas prints, pillows, and much more. Many of their products are breed specific, in fact. Special thanks to my photographer - Lily (my daughter). My dog bone earrings are from For Love of a Dog Jewelry. When offered the chance to review one of the T-shirts, I was excited to find several Pit Bull items on the Dog City & Co. website. Here's the link to the shirt I am wearing in my photos. You can find more Pit Bull items from Dog City & Co. here. And if Pit Bulls aren't "your breed", there are many other breeds to choose from. 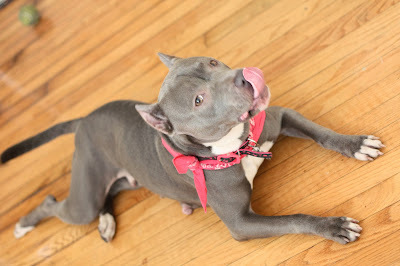 I was pleasantly surprised while reading more about Dog City & Co. to see that the owners are "proud pet parents" to a rescued Pit Bull named "The Squanch". The company donates a portion of every sale to animal rescues and also works directly with pet rescues to help them raise money for their efforts. And on top of being a charitable company, Dog City & Co. also manufactures all of their products in the USA with American-made materials and eco-friendly inks whenever possible. Me and my Pit Bull - Shiner. Here's to hoping that everyone enjoys National Pit Bull Awareness Day! I'll be enjoying mine in my new T-shirt with my very own Pit Bull by my side. Disclosure: I received the product mentioned in this post at no charge for a fair an honest review. All opinions expressed here are my own. No other compensation was received and Pawsitively Pets only shares information we feel is relevant to our readers. I haven't such a shirt - but I wear one in my mind today and all days. Pitbulls are wonderful!!! Education....education...never the dogs it is the people. Bravo to those that take on the rescues. Have a super Saturday. That's a good way to bring awareness, and start a conversation. You look great in your shirt. Any word on Honey Delight? Aw, Shiner is such a loving BFF! You are lucky, Miss Ann. And I agree with the statement on your t-shirt...Ma knows a few Pitties and she says they are the funniest, loving dogs ever! Great post and I love the T shirt. We love Pitties and really get upset over the bad rap they get all of the time. I loved my little Pittie. She was the most awesome dog. Great post and the t-shirt is the best! We can can never do enough education! Thank you so much for this wonderful post! That is an awesome tshirt! Love the shirt. I have a shirt with a pit bull on it that says 'I'm a lover, not a fighter.' So true! What a great t-shirt. Such a great post, we'll start sharing! That's a great shirt, Ann. We know so many pibbles, and we love, love, love them! 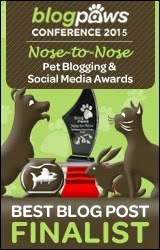 Our silly insurance company is BSL ~~ Pitties & Pit-types, GSDs, Akitas, Rotties, Dobermans. The list of other insurance companies is even longer. Unfortunately, $1200 a year is a big enough reason for us not changing to another company. Our dogs probably wouldn't be eating raw if $1200 were added on to our budget. They're even worse about our rental house. They said that renters can't have any dogs at all. Things like this are just another part of what Pit-abusers and those refusing to train their dogs properly have done to our world of loving dogs. Worst thing is, they didn't tell us about their breed-policy until we got a new house and were turning our old one into a rental. I'd been thinking seriously about getting a GSD because I was raised with the breed. Finding a new company would have been forced upon us then because I would never get rid of any of my dogs. I can fall in live in the time it takes to blink. The deeds done to these dogs is just unfair in so many ways it's not funny. Yea you're right. Many years ago when my friends with 2 pit bulls moved into their house, the insurance people came took one look at their dogs and said "You're going to have to get rid of those dogs." My friend turned to the insurance person and said "I don't think so. Looks like we're going to have to get rid of you." That shirt and earrings look very nice on you, Ann! They have a lot of nice stuff on that site...adding it to my Xmas shopping sites! Thanks Jan! I think the site is great for Christmas gifts. The mom's sister has a pit bull mix named Skittles. She is so pretty, and very strong, and a bit bull headed, but the mom just loves her. She has the sweetest personality and is just a love bunny. They can be a bit stubborn sometimes hehe... at least mine is anyways. Skittles sounds like a doll! 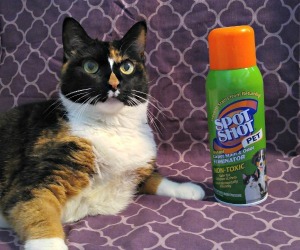 Great photos of you and Shiner! And I did a double-take on that t-shirt too...thought it WAS Shiner for a moment! love this post! so true that pit bulls shouldn't get a bad reputation. love this cause! Pitbulls are super sweet! When they're trained, they can be the best companions! I'm still scared when they're not trained & jump up, because they're so powerful. A friend of mine lets his be a bit too wild for my comfort. But they are so cute. I would adopt one, making sure he was well behaved. Love the shirt! Thanks for sharing!